Pirates of the Caribbean meets Greenpeace, starring Ewan McGregor! An eco film? An eco film biopic? An eco film biopic that's been a rotating door of potential leading men and that's been in development since 1981? Ocean Warrior has to be good! Ewan McGregor has lent his star power to the film Ocean Warrior. Supposedly it includes incidents from the life of the Sea Shepherd Conservation Society founder Captain Paul Watson. In fact, it's going to be a pirate film with an eco twist. 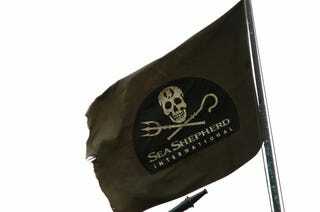 If you have any doubts, look at the Sea Shepherd flag above. Yes, Whale Wars probably kept the idea humming, but there aren't that many movies based on Discovery shows. I'm not saying anything about the society, but the film itself wouldn't have gotten a boost without a certain Disney franchise. It certainly wasn't anyone's top priority. The film has been floating around Hollywood since 1981, which means that even if it gets made and released this year, it has been in development as long as a Senator. I'm actually interested to see what comes out of this long incubation period, but I don't think anyone expects an factual story. We can probably expect to see a nautical action film with an environmental twist here and there. And since the Sea Shepherd Society was founded in 1977, when psychedelic drugs were in use, I think that the Pirates franchise won't be the only film with mermaids.